This computer graphic depicts the orbit of comet 2013 A1 (Siding Spring) through the inner solar system. Comet 2013 A1 (Siding Spring) will come within about 31,000 miles (50,000 kilometers) of Mars in October 2014, according to the latest estimate from the Near-Earth Object Program Office at NASA's Jet Propulsion Laboratory (JPL) in Pasadena, Calif. 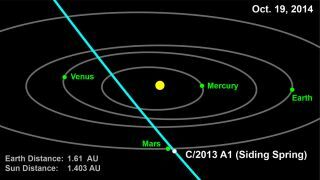 The trajectory of 2013 A1 (Siding Spring) is still not known well enough to rule out a dramatic comet collision with Mars, though that could change. "At present, Mars lies within the range of possible paths for the comet and the possibility of an impact cannot be excluded," JPL officials wrote in an update today (March 5). "However, since the impact probability is currently less than one in 600, future observations are expected to provide data that will completely rule out a Mars impact." As seen from Mars, Comet Siding Spring should reach a visual magnitude of zero or brighter, officials added. That means the comet should be at least as bright in the Red Planet sky as Saturn is at its most brilliant in Earth's night sky, so spacecraft such as NASA's Mars Reconnaissance Orbiter could get a decent show. The prospects for Earth-based stargazers aren't as exciting, unfortunately. Astronomer Rob McNaught discovered the comet on Jan. 3, 2013, using observations made by Australia's Siding Spring Observatory. Since then, researchers have unearthed archival observations of the comet going back to October of last year. The size of Comet Siding Spring is unknown, with estimates of its diameter ranging from 5 miles to 30 miles (8 to 48 km). The icy wanderer probably hails from the distant Oort Cloud — which begins nearly 1 light-year from the sun — and has been speeding toward the inner solar system for more than a million years, researchers said.